So.....today, Thursday, is the day of the week that I usually feature my weekly Simply Stampin' Up! project. You know, where I take a published Non-SU! project and re-create it using ALL SU! products. Well, for the last two weeks I've been so busy stamping for upcoming classes and getting projects ready for the fast-approaching holidays AND being Mom (what's up with that?) that I haven't had any time to just stamp for ME! 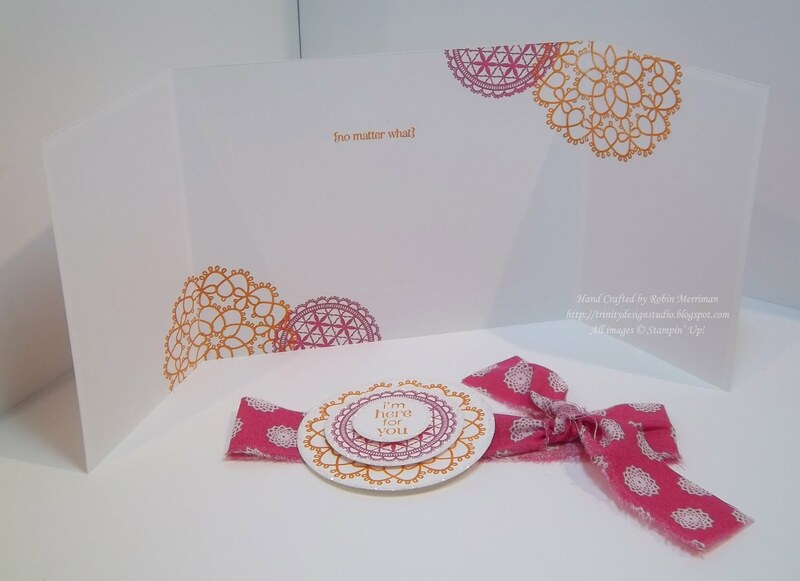 And that's really what that feature is for me - a personal challenge to take a project I love in a magazine and make it using all the products I love - Stampin' Up!. So....no Simply Stampin' Up! project this week. We're gonna give it the ol' college try for next Thursday, ok? But, I do have a card to show you - it's one of the designs we're doing at Stampin' at the Firehouse tonight. 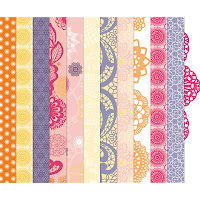 It's a simple gatefold card that I dressed up with the Flirtatious Designer Paper and Fabric. I love using the Designer Fabric in strips as ribbon on my card projects. It's such a fresh and unexpected element and gives a fun, shabby chic look that really makes me smile. I started with a piece of Whisper White cardstock cut at 4 1/4" x 11". Using the AWESOME new Simply Scored Scoring Tool, I scored the cardstock at 2 3/4" and 8 1/4". 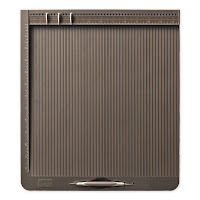 This created the evenly spaced front flaps that fold in towards each other to make the "gatefold". Each of these panels were covered on the front with pieces of the Flirtatious Designer Paper cut at 2 1/2" x 4". For the ribbon, I tore a 1" x 18" strip of fabric and simply tied it around the middle of the folded card. 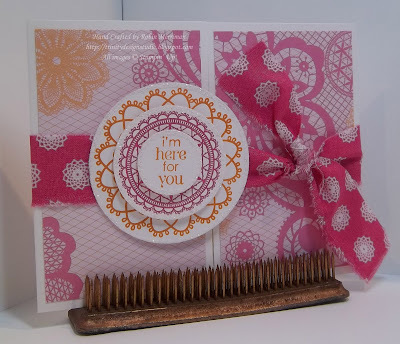 I used the Delicate Doilies stamp set and stamped one doily with Pumpkin Pie Classic Ink and the other with Melon Mambo Classic Ink on Whisper White cardstock. 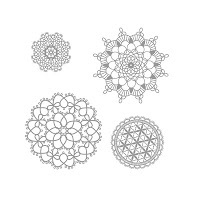 They were punched out with the 2 1/2" Circle Punch and the 1 3/4" Circle punch, edged with Dazzling Diamonds glitter and adhered together with Stampin' Dimensionals. The greeting is from Petite Pairs and I stamped it then punched it out with the 1" Circle Punch. It's got a little glitter too and was dimensionaled onto the doily. To adhere them to the fabric, I simply used SNAIL adhesive on the fabric strip. Worked great! More stamped doilies and the inside greeting and it's all done! I hope you like this bright, fun card - it's like looking at a party on a card with those awesome colors! I'm off now for a super busy, but very fun stamping day! I'm putting the finishing touches on my designs for this Saturday's Christmas in September class and I have Stampin' at the Firehouse tonight! Good times! 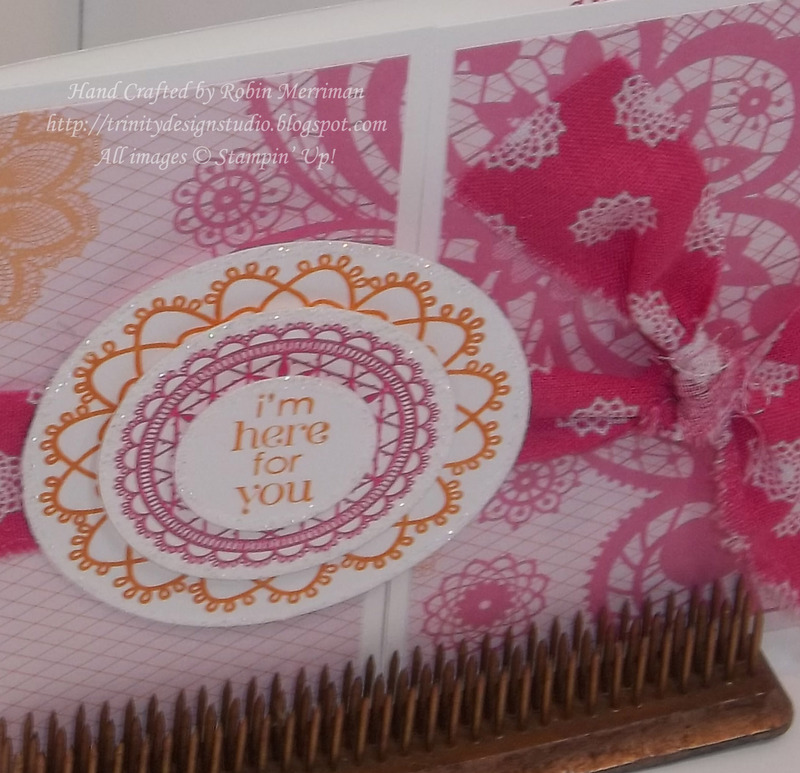 You can check out my Online Stampin' Store to find all the products I've used here today and when you do, be sure to check out the Clearance Rack section as well. There are always some great bargains in there! Simply click the SHOP NOW button at the top right of the page!